Angela is a teacher and artist, who lives in South Wales. Through Dover and the magic of the internet, I was able to share a virtual cup o’ tea with Angela, and ask some questions about her art. Angela: I have long been ‘nagged’ by artists who like my work on deviantART and Paintings I Love, as well as some of my work colleagues to do so. When I was about to approach publishers with my art, they got in touch with me before I could get in touch with them! Angela: All my life in one way or another, but with an idea that I’m an artist it’s been around 12 years I think now. Angela: I don’t do any digital work other than scanning my art work in. I work straight to paper with pen, occasionally outlining parts of my work with pencil first. Angela: I have created rather abstract textile and bead jewellery. My art journal is something I love. When I was taking my A level in art around 11 years ago, I loved to work in clay, though I don’t get the chance now. Angela: It varies so much. Coloured pencils are a firm favourite – I love Faber-Castell’s Polychromos pencils. I also like watercolour paints, markers and water-soluble felt pens such as Ranger’s Distress Ink Markers or Zig’s Dual Tip Markers. I like to add fine detail patterns using fine-liner pens such as those made by Staedtler. When not for publishing, Sakura’s various glittery/glimmery pens, metallic gel pens and paints, such as those made by Cosmic Shimmer, are added. One of my favourite adages is, “If in doubt, just add glitter!”, but subtly in my case. Angela: I don’t get the time to relax with other people’s work! If I’m not drawing colouring templates for Jason Schneider or a couple of other editors I work with then I’m creating and colouring my own art projects. Angela: Purples, pinks, blues and blue-greens are firm favourites of mine, with yellows and oranges and reds and yellow-greens to help make the colours jump and glow. 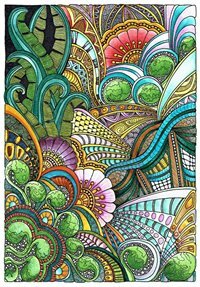 Angela: I love to draw very abstract, intuitive pieces of work that are rather intricate in design. I draw inspiration from nature, architecture, prehistoric art, gothic and Romanesque architecture/art, geometric shapes, symbols, space, words, emotions. I rarely plan anything out, I just put pen to paper and see what appears and work with any ‘mistakes’ that may appear as they end up an important feature, a turning point in the finished work. 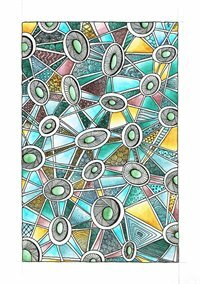 Angela: My art journal is one thing that I love to do in between coloring book art creation. Weirdly, I love to spend time in old churches, abbeys, cathedrals, monasteries and cemeteries (I find the stories the headstones have to tell fascinating, especially the symbolism that is used on them). I also have a bit of a thing about steam trains and have had the pleasure and privilege to have been allowed to drive one once – great fun! 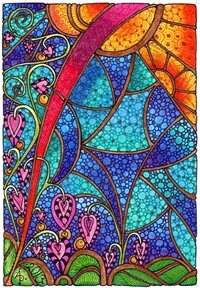 I love music and play the flute and keep meaning to practice/learn to play my electric folk harp, but art keeps me busy. Angela: A response I’ve had to my art, was a request to copy some of the art for cancer patients receiving chemotherapy/treatment in a cancer centre as many of them had found the images very soothing and helpful. I of course said yes, and felt that one of my goals in sharing my art was being met – that of helping others to find the same kind of peace and contentment I do when I create art. Another wonderful request was from one of my pupils at school who asked if he could use me as one of his artists for his GCSE coursework, and of course that wasn’t a problem either. Angela: The ability to help people learn to believe in themselves, love themselves and do the things that bring them joy and peace. If I couldn’t have that then I’d want to be a Jedi Master and to be able to use the force! Angela: I don’t have just one – I love MC Escher, Hundterwasser, Kandinsky, Ernst Haekel, Georgia O’Keefe, Juan Gris, William Morris, Art Nouveau, La Tene culture art, Celtic art, Neolithic and Bronze Age pottery patterns, Romanesque architecture and sculpture, Illuminated medieval manuscripts such as the Book of Kells and the Lindisfarne Chronicles…oh, and nature! 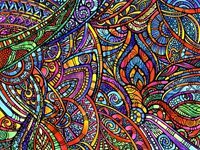 Angela: A blank piece of paper that needs to be decorated with lines that flow and curve and create intricacy, pattern and interest. Mary: I think we can all agree that Angela’s feelings about a blank piece of paper are similar to what colorists feel when they have an uncolored design waiting to be filled with color!